With President Trump in office, economists have been revising their GDP growth forecasts for 2017. This is a good time to review why consensus forecasts are unable to anticipate changes in the cyclical direction of growth, let alone recessions. In this regard, we explained in 2001 that “consensus forecasts have never predicted a recession because they are based on extrapolative models and misunderstandings about the behavior of GDP during recessions.” ECRI had already made a timely recession call early that year. 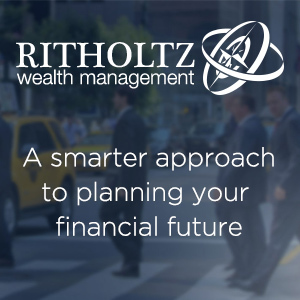 The subsequent failure of the consensus to predict the Great Recession is well known. But this is not just an issue of recession forecasting. After all, the economy also exhibits growth rate cycle (GRC) upturns and downturns – alternating periods of accelerating and decelerating economic growth. With GRCs being more frequent than business cycles, it is also important to assess the accuracy of consensus forecasts in anticipating GRC turning points. The Survey of Professional Forecasters (SPF), compiled by the Philadelphia Fed since 1990 is the oldest quarterly survey of U.S. macroeconomic forecasts, going back nearly half a century. We therefore delve into the SPF data for answers. The question at hand is the SPF’s ability to anticipate GRC turning points. Thus, we examined how the SPF’s 2-quarter and 4-quarter-ahead median forecasts for quarter-over-quarter annualized growth in real GDP have behaved around GRC turning points, compared with growth in the U.S. Long Leading Index (USLLI), one of ECRI’s leading indexes specifically designed to forecast such turning points in economic growth. We found that the 4-quarter-ahead consensus forecast (Chart 1, black line) is roughly coincident with GRC turning points (beginning and end of orange shaded areas). Furthermore, it has never predicted negative GDP growth, meaning that any forecast for a recession one year away should be taken with a generous heap of salt. The SPF has always included a current-quarter forecast made around in the middle of that quarter, but an analogous examination indicates that it does not perform any better than the 2-quarter- and 4-quarter-ahead forecasts in anticipating GRC turning points, while being roughly coincident with those GRC turns (not shown). In contrast, USLLI growth not only leads all business cycle turning points but also typically leads GRC turning points by a few quarters. 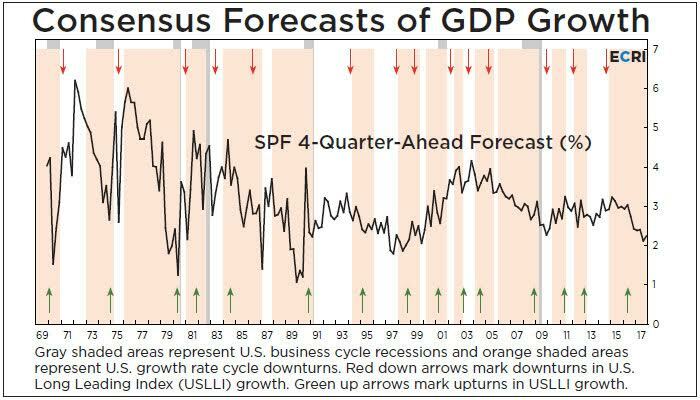 Naturally, USLLI growth exhibits similar leads over turning points in the SPF 2-quarter- and 4-quarter-ahead forecasts, with the leads being slightly shorter over the 2-quarter-ahead forecast than over the 4-quarter-ahead forecast. In sum, consensus forecasts have not only failed to predict recessions, but also cannot anticipate growth rate cycle peaks and troughs, which USLLI growth peaks (red down arrows) and troughs (green up arrows) lead quite consistently. It is clear, therefore, that consensus forecasts are not so useful when it comes to the timing of GRC turning points. 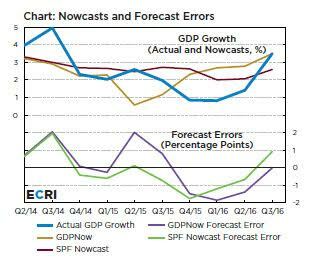 Even so, it is worth examining the magnitudes of consensus forecast errors (actual GDP growth minus forecast). As Chart 2 illustrates, the 4-quarter-ahead SPF forecast (upper panel, black line) shows very little variability, while actual GDP growth fluctuates much more. Specifically, the standard deviations of the 4-quarter-ahead forecasts and actual GDP growth are 1.0 and 3.3 percentage points, respectively. The variability of the current-quarter forecast is closer to that of actual GDP growth, but still much lower, with its standard deviation being 2.2 percentage points (not shown). In other words, the consensus forecast shows unrealistic expectations of stability in GDP growth. 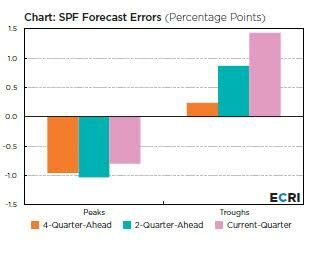 Not surprisingly, the forecast errors are relatively large for the 4-quarter-ahead forecasts (lower panel, teal line). Meanwhile, the forecast errors themselves exhibit cyclical patterns. As the lower panel shows, consensus forecast errors tend to be positive around GRC peaks, and negative around GRC troughs. Since consensus forecasts are extrapolative, and thus unable to predict cyclical turns, their forecast errors tend to become larger near turning points, the forecasts being too high following peaks and too low after troughs. In other words, consensus forecasts have generally been unable to anticipate the decline in GDP growth in the quarter following the GRC peak, and also failed to foresee the improvement in GDP growth in the quarter following GRC trough. Chart 3 is a summary of the magnitudes of the SPF forecast errors around GRC peaks and troughs since 1990, when the Philadelphia Fed took over the survey. As shown in the chart, in the quarter immediately following the GRC peak the average forecast error of the 4-quarter-ahead, 2-quarter-ahead and current-quarter forecasts was negative, being about one percentage point in each case (left set of bars). In other words, all of them tend to overestimate GDP growth rather substantially when it is about to turn down. 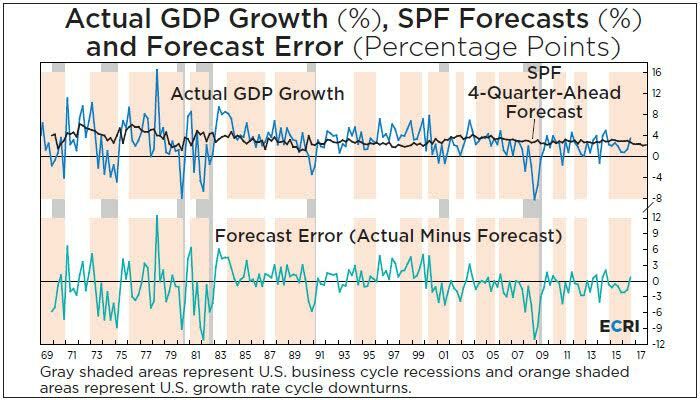 Conversely, the SPF forecast errors tend to underestimate GDP growth when it is starting to turn up. Therefore, the average forecast error in the quarter right after a GRC trough was positive, with the average forecast error actually being the smallest (around a quarter of a percentage point) for the 4-quarter-ahead forecasts, almost one percentage point for 2-quarter ahead forecasts, and more than one percentage point for current-quarter “forecasts” (right set of bars). It is paradoxical that, around GRC troughs, nearer-term consensus forecasts were actually worse. Such large forecast errors are in some sense inevitable, as consensus forecasting models tend to be backward-looking, extrapolating recent patterns into the future. This results in large deviations from actuals precisely in the vicinity of cyclical turning points. Growth in real GDP is a key measure of the pace of economic activity, but it is released with a lag whose timing can be important for policymakers, business planners, and investors. 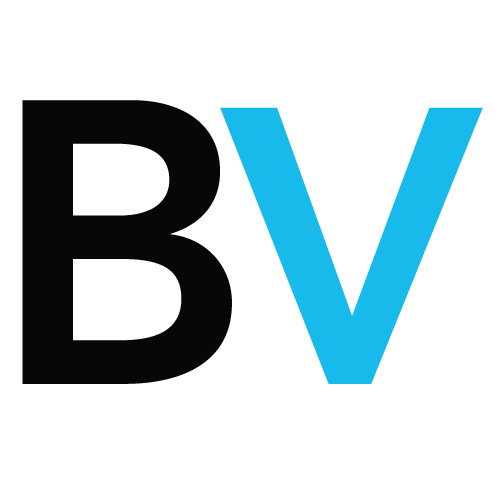 Following several decades of forecasting failure, many economists have turned to “nowcasting,” a short-range “forecasting” method, estimating GDP growth for the current quarter before the official release. 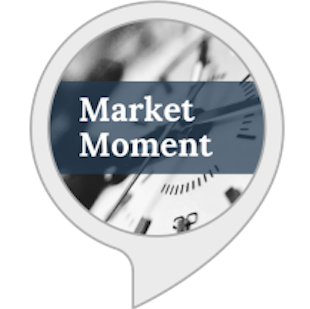 As a result, the popularity of nowcasts has increased dramatically in recent years since the Atlanta Fed started releasing its “GDPNow” nowcasts two and a half years ago. We compared the SPF nowcast in the form of current quarter forecasts with the Atlanta Fed’s GDPNow nowcasts released at around the same time, i.e., the middle of the quarter. Chart 4 shows the SPF nowcast (upper panel, burgundy line), the mid-quarter GDPNow nowcast (yellow line), and actual GDP growth (blue line) for the past ten quarters. The lower panel shows the “forecast” error of the GDPNow prediction (purple line) and the SPF nowcast (green line). It is evident that the GDPNow is less accurate than the SPF nowcast. Specifically, the mean absolute error of GDPNow is 1.1 percentage points, while that of the SPF nowcast is less than 0.9 percentage points. The Atlanta Fed GDPNow tends to improve as it approaches the end of the quarter, as more monthly source data become available. Still, these results suggest that, on a contemporaneous basis, it is less accurate than the SPF nowcast, which itself is not all that accurate, especially at GRC turning points. Despite the attention garnered by consensus forecasts of both the long-term and nowcast varieties, they consistently fail to anticipate turning points in the economy. In fact, these are the precise times when their forecast errors are the largest. This is because consensus forecasts tend to extrapolate growth trajectories from the recent past into the future, which means their forecast errors balloon in the vicinity of GRC turning points, when such assumptions naturally break down. 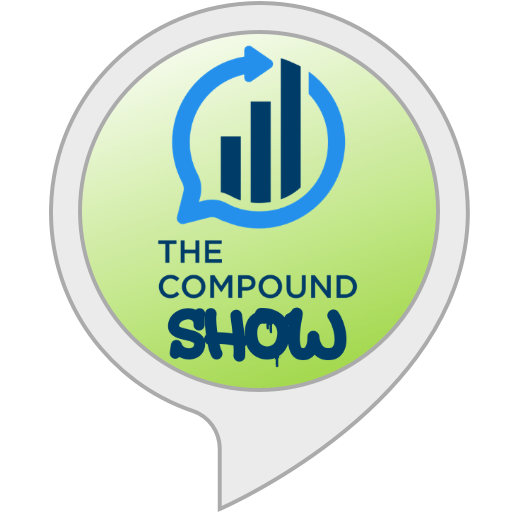 Leading indexes like the USLLI, on the other hand, are specifically designed to anticipate cyclical turning points, and lead them fairly consistently. As we are now in the grip of the yo-yo years, where falling long-term trend growth dictates more frequent recessions, real-time monitoring of ECRI’s leading indexes can prove invaluable at the very junctures where the consensus is set to fail.